Valiant’s Third Annual Summit to Feature News and Announcements from Special Guests Christos Gage, Eric Heisserer, Jody Houser, Matt Kindt & More! Valiant is proud to announce #ValiantSummit 2017 – the award-winning publisher’s third annual media event, broadcasting live from Twitch TV’s Hyper RPG Studio in Los Angeles! On Monday, April 17th at 2 pm ET/11 am PT, join Valiant and an all-star line-up of special guests – including Harvey Award nominee Christos Gage (Netflix’s Daredevil), Academy Award nominee Eric Heisserer (Secret Weapons), acclaimed writer Jody Houser (Faith), and New York Times best-selling writer Matt Kindt (X-O Manowar) – as they unveil a blockbuster line-up of news and announcements for the coming year and beyond! With Valiant’s biggest debut of all time – the sold-out X-O MANOWAR (2017) #1, on shelves now – sending shockwaves through the comics industry, 2017 is already the biggest year yet for the largest independent superhero universe in comics. Now, find out what epic events await Valiant’s greatest ICONS with a stunning presentation revealing what lies ahead for FAITH, NINJAK, SHADOWMAN, QUANTUM AND WOODY, and many more in the year to come, only at #ValiantSummit 2017! 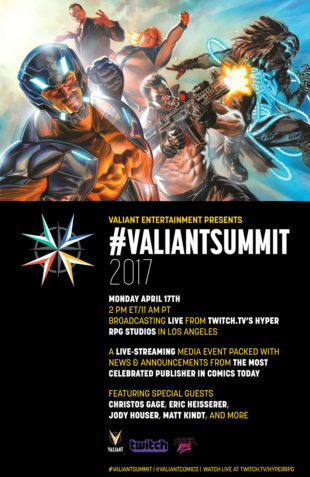 Follow all of #ValiantSummit 2017′s news and announcements as they happen with a live stream on Twitch TV’s Hyper RPG channel, Facebook Live or Twitter. And join the conversation on Twitter at the official @ValiantComics account or follow along with coverage live from #ValiantSummit 2017 from the preeminent press outlets in comics today! Plus: Look for a series of exclusive post-game recaps of all of #ValiantSummit 2017′s events with interviews, analysis, extras, and more everywhere throughout the day! MEDIA NOTICE: Space for #ValiantSummit 2017 is limited. If you are a member of the press and would like to attend in person on Monday, April 17th live in Los Angeles, please email hunterg@valiantentertainment.com to inquire about availability. Originally founded in 1989, Valiant Entertainment is one of the most successful publishers in the history of the comic book medium with more than 80 million units sold and the third largest library of superhero characters in comics. In 2012, Valiant roared back to the fore with four new titles released under the banner of “The Summer of Valiant” – a relaunch that quickly established itself as the biggest debut of a new comic book publisher in more than a decade. Beginning with X-O MANOWAR #1 by New York Times best-selling writer Robert Venditti and Eisner Award-winning artist Cary Nord, which ranked as the year’s best-selling new series from any independent publisher, Valiant has gone on to produce some of the highest selling and most critically accoladed comic titles anywhere in the industry. During the same period, the resurgent Valiant was also awarded a coveted Diamond Gem Award for Publisher of the Year after just seven months of publishing, marking the fastest time that any new publisher had been named to one of comics’ highest honors. In 2015, Valiant announced a multi-picture deal to bring Bloodshot and Harbinger to the big screen as feature films. Consistently rated year over year as the most acclaimed comic book publisher in the industry today, Valiant has received hundreds of awards, nominations, and critical accolades, culminating in 2016 with a record-setting 50 Harvey Award nominations – the most ever received by a single publisher in the history of one of the comic book industry’s most prestigious awards. Established in 2015 with the first #ValiantSummit broadcast live from Twitter’s San Francisco headquarters, the annual #ValiantSummit is Valiant’s biggest and most anticipated live media event of the year. Last year, Valiant followed suit and teamed with the historic Upright Citizen’s Brigade Theatre in New York City for the second annual #ValiantSummit and revealed first word on multiple best-selling series including FAITH, BRITANNIA, SAVAGE, HARBINGER RENEGADE, and more before a packed studio audience. On Monday, April 17th at 2 pm ET/11 am PT, find out what the future holds for the most celebrated publisher in comics today as Valiant unveils #ValiantSummit 2017 – broadcasting live on Twitch TV’s Hyper RPG channel, Facebook Live and Twitter. And don’t forget to join the celebration by using the #ValiantSummit hashtag!